Wild grapes grow along the roadsides in Capay Valley, California. Here's my favorite way of using them: squishing them into juice. 1. Wash and put the grapes into a large ziplock bag. Seal the bag, removing as much air as possible. 2. Squeeze the grapes with your feet or fingers. Pop all the grapes. This is a very pleasant sensual experience! 3. 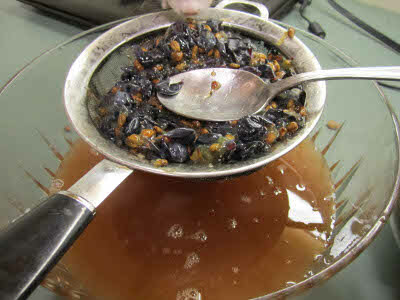 Pour the grapes pulp into a strainer and press with the back of a spoon, catching the juice into a bowl. 4. Do not heat the juice! Heating it removes much of the delicious flavor. You can strain it further, but I don't. 5. Refrigerate or freeze the juice. 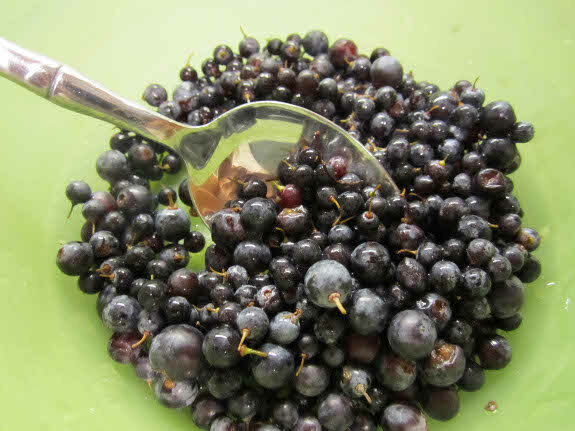 If you allow the juice to stand at room temperature for a day or so before refrigerating it, you will get some natural carbonation from the yeast on the grape skins. I like this. I get rave reviews from friends about the freshness of this juice and I serve it at my B&B, Cache Creek Inn. 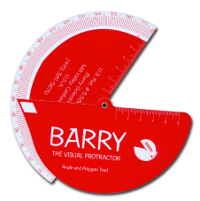 In addition to running Cache Creek Inn, Camilla Barry and her husband invented the visual protractor shown here, which they describe as "the world's easiest protractor --- anyone can use it!" If you'd like to share a guest post with our readers, check out our submission policy. We love learning about what other homesteaders are doing across the country and around the world! That grape juice sounds delicious! I know they have some kinds of wild grapes around here, I'll have to start looking for some. The muscadines taking over my tomato plants should be ripe in a couple of months. I set making a little muscadine wine as a goal for this season. I've been doing some thinking on how to get the juice out. I'm going to use your method. Eric --- I'll be curious to hear how wild Japanese grape juice tastes. Braddock --- This does sound like a relatively easy method if you've just got a small harvest.